$206.84 - Baxton Studio CF8276-FULL-WHITE Battersby White Modern Bed with Upholstered Headboard - Full - 37 x 57 x 83.67 in. Home Furniture>Bedroom>Beds>Beds Baxton Studio CF8276-FULL-WHITE Battersby White Modern Bed with Upholstered Headboard - Full - 37 x 57 x 83.67 in. 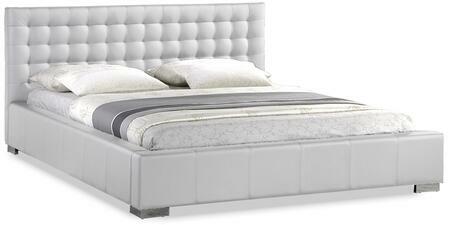 Baxton Studio CF8276-FULL-WHITE Battersby White Modern Bed with Upholstered Headboard - Full - 37 x 57 x 83.67 in. Turning in for the night is a delight with the Battersby Designer Bed. The simple minimalist contemporary bed design is made in Malaysia soft buttery matte white faux leather foam padding and an engineered wood frame. Dark brown rubber wood legs plus silver upholstery tack detailing on the perimeter of the headboard add charm. As a full sized platform bed the Battersby does not require a box spring: only a mattress is needed which can be set atop the wooden slats included. Maintenance is simple: just wipe the bed’s surfaces with a damp cloth before wiping dry. The Battersby Bed is also in black as well as both black and white in queen size each sbtained separately. Assembly is required. 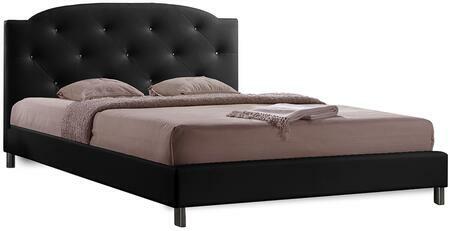 Baxton Studio BBT6376-Black-Full Carlotta Black Modern Bed with Upholstered Headboard - Full - 47.44 x 56.89 x 82.09 in. Clean crisp and contemporary is the Carlotta Designer Bed frame. Soft black faux leather outfits a scallop-cornered headboard with matching upholstered side rails and low footboard making this a sleek style for sleeping. Malaysian-made the full sized Carlotta Contemporary Bed features an inner frame of hardwood and plywood which are padded with foam before being upholstered. Faux crystals stud the headboard creating a trendy button tufted look. This is a platform bed: wooden slats included serve as a box spring so only a mattress and bed linens are needed mattress and linens are not included. Tying everything together are silver metal legs with non-marking feet. Easily maintain the Carlotta Bed by wiping clean with a damp cloth as needed. This style requires assembly and is provides in black full queen and king size or white full queen and king size; each sbtained separately. Bring some whimsy back into your bedroom. 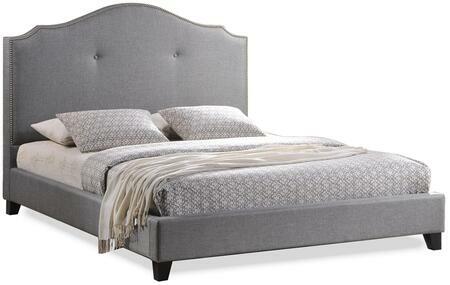 Our Marsha Designer Bed features an elegant scalloped headboard with silver nail head trim aL its border. This option is a queen size made with gray linen upholstery though we also offer black or white faux leather in various sizes (each sold separately). A wooden frame with black wood legs and foam padding complete your new contemporary bedroom furniture. Seeing that this is a platform bed a box spring is not required (slats are included). This Malaysian-made bed requires assembly and should be spot cleaned. 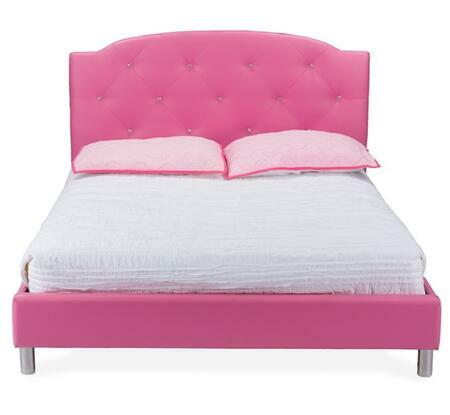 Queen Bed Dimensions: 51.75 H x 66 W x 88.25 L headboard: 66Wx51.75H siderail:81.5Dx12H footboard:66Wx11.5H internal dimension: 61Wx81D height to top of slat:8 height of legs: 7.25. Grab some Zs and count some sheep: get a good nights sleep in the sophisticated Vino Designer Bed. The queen-sized modern bed frame is constructed with solid rubberwood padded with foam and upholstered with black faux leather. Glittering faux crystal buttons dot the headboard for a touch of regality. Seeing that this is a platform bed and wooden slats are included with purchase only a mattress is required. To clean wipe with a damp cloth. This Malaysian-made contemporary bedroom furniture piece requires assembly and is available in both black and white in either full or queen size. Grab some Zs and count some sheep: get a good nights sleep in the sophisticated Vino Designer Bed. The full-sized modern bed frame is constructed with solid rubberwood padded with foam and upholstered with white faux leather. Glittering faux crystal buttons dot the headboard for a touch of regality. Seeing that this is a platform bed and wooden slats are included with purchase only a mattress is required. To clean wipe with a damp cloth. This Malaysian-made contemporary bedroom furniture piece requires assembly and is available in both black and white in either full or queen size. Bring function and style together with the space-saving Emilie trundle daybed. This modern and contemporary-inspired daybed is made to last with a solid rubberwood and engineered wood construction. The Emilie is upholstered in gray fabric with button-tufting details on the back front and side panels. The deftly-stepped headboard style is complemented with rolled arms bringing a charming element of style to your bed room guest room or nursery. A chrome-colored nail head trim adds a hint of glam to the Emilie allowing you to relax in lounge in this chic daybed. The daybed also features a roll out trundle perfect for guests sleepovers and saving space. Made in Malaysia the Emilie requires assembly. Grab some Zs and count some sheep: get a good nights sleep in the sophisticated Vino Designer Bed. The full-sized modern bed frame is constructed with solid rubberwood padded with foam and upholstered with black faux leather. Glittering faux crystal buttons dot the headboard for a touch of regality. Seeing that this is a platform bed and wooden slats are included with purchase only a mattress is required. To clean wipe with a damp cloth. This Malaysian-made contemporary bedroom furniture piece requires assembly and is available in both black and white in either full or queen size. 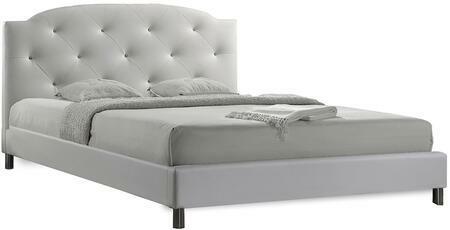 Baxton Studio CF8609-Full-Grey Romeo Contemporary Grey Button-Tufted Upholstered Full Bed - 50 x 56.88 x 80.25 in. Bring this Romeo Button-Tufted Upholstered Bed to your bedroom and make sweet dreams even sweeter. The full size button tufting bed frame features a slight arching headboard adds a classic touch to the contemporary style. Beautifully classic bed with stylish lines supports standard-size box spring. Bed frame designs with quality solid-wood with polyurethane foam padding and solid wood legs covered by the upholstered fabric. Grab some Zs and count some sheep: get a good nights sleep in the sophisticated Vino Designer Bed. The queen-sized modern bed frame is constructed with solid rubberwood padded with foam and upholstered with white faux leather. Glittering faux crystal buttons dot the headboard for a touch of regality. Seeing that this is a platform bed and wooden slats are included with purchase only a mattress is required. To clean wipe with a damp cloth. This Malaysian-made contemporary bedroom furniture piece requires assembly and is available in both black and white in either full or queen size.